The frosted elfin (Callophrys irus) is a localized and declining butterfly found in xeric open habitats maintained by disturbance. We described the effects of woody plant canopy cover, topography and host plant size and density on the quality of microhabitat of wild indigo (Baptisia tinctoria) host plants containing late instar frosted elfin larvae at four study sites in southeastern Massachusetts, United States. We also assessed whether females preferentially depositing eggs on host plants within specific microhabitats, therefore conferring greater survivorship to the larvae through the late-instar stage. We found that moderate amounts of canopy cover and large plant size characterized larvae-occupied host plants. In the absence of tree canopy cover, late instar larvae density remained low even when host plant density was high. However, females oviposited on wild indigo plants without regard to any of the vegetative or environmental variables we measured. 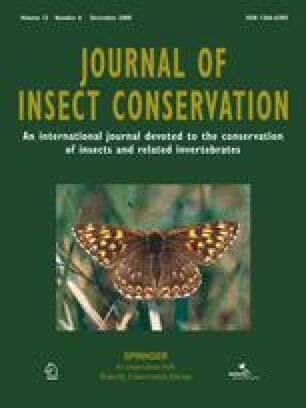 These results indicate that canopy cover was an important characteristic of microhabitats containing late instar larvae, and late instar larvae occupancy was determined by suitable microhabitat conditions, and not female oviposition selection. Managing for canopy cover and microhabitat heterogeneity within relatively open habitats is recommended for the maintenance of frosted elfin populations. K. McGarigal, M. W. Nelson, and E. M. Steinauer provided valuable reviews and their comments greatly improved this manuscript. We gratefully acknowledge funding and support from the Natural Heritage and Endangered Species Program, of the Massachusetts Division of Fisheries and Wildlife, The Massachusetts Environmental Trust, The Massachusetts Audubon Society, The Nature Conservancy and The Trustees of Reservations. We would also like to thank all the volunteers that contributed their efforts to this project. A special thanks to Stephanie and Skyesha Albanese, Richard Couse, Brad Compton, Mark Mello, Andrea Jones, and Tim Simmons whose help made this project possible.